After grabbing drinks at The Coffee Bean & Teaf Leaf’s Beanstro at The Shoppes at Marina Bay Sands, we tested our luck at the Marina Bay Sands casino with our friends Tom & Elaine. To gain access to the Marina Bay Sands casino, Singaporeans must pay $100 to enter. Other nationalities do not need to pay a fee, but are required to present their passports twice upon entrance and twice when exiting. Security is tight! Cameras are not permitted, so unfortunately we have no photos of the interior of the casino. But it is massive, and there are a lot of gambling options – 500 tables and 1,600 slot machines. Even though we were already overly-caffeinated from Beanstro, we still enjoyed complimentary coffee offered by friendly baristas wandering the casino floor – they know how to keep gamblers’ energy high. 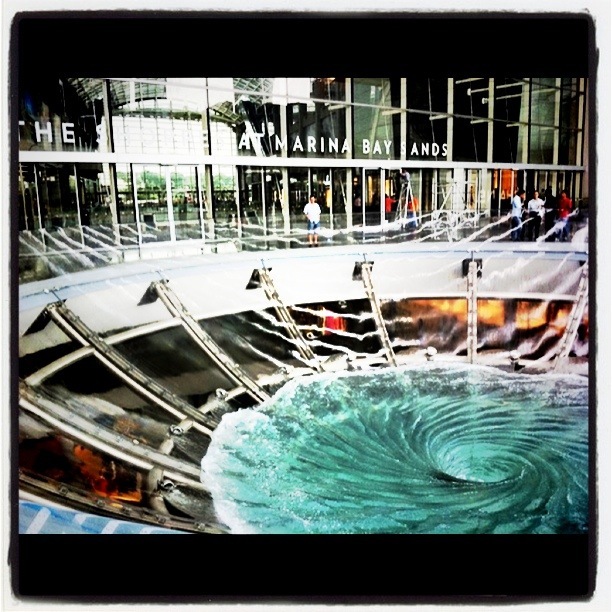 Extraordinary art installations are integrated within Marina Bay Sands iconic architecture. 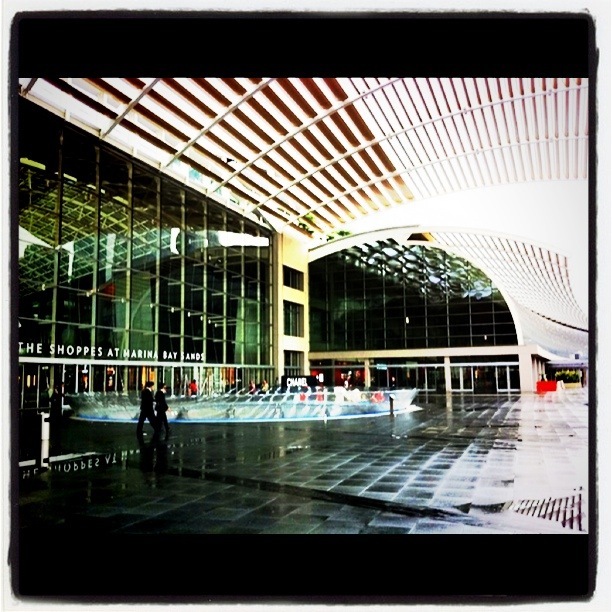 The Rain Oculus (pictured above) is a 22 meter diameter acrylic basket mounted on top of a tubular stainless steel structure. 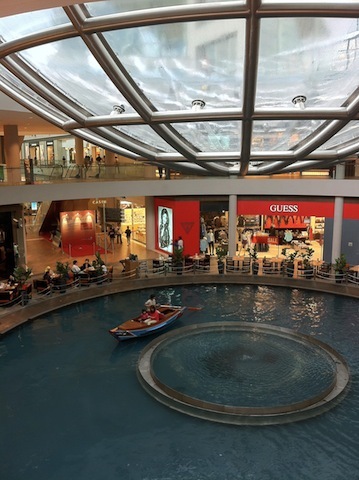 The Rain Oculus creates a massive whirlpool above the promenade level with the water falling two stories through a hole – creating a dynamic water skylight feature at the heart of The Shoppes (Burberry, Cartier, CHANEL, Dior, ESCADA, FENDI, Gucci, Hermès, MIU MIU, Salvatore Ferragamo, Yves Saint Laurent, and more) retail mall. The casual Beanstro by The Coffee Bean & Tea Leaf (coffee shop + restaurant in-one) overlooks the central canal at The Shoppes, and its parade of beautifully crafted sampans. You can see Beanstro seating in the above photo, on the left of the canal. 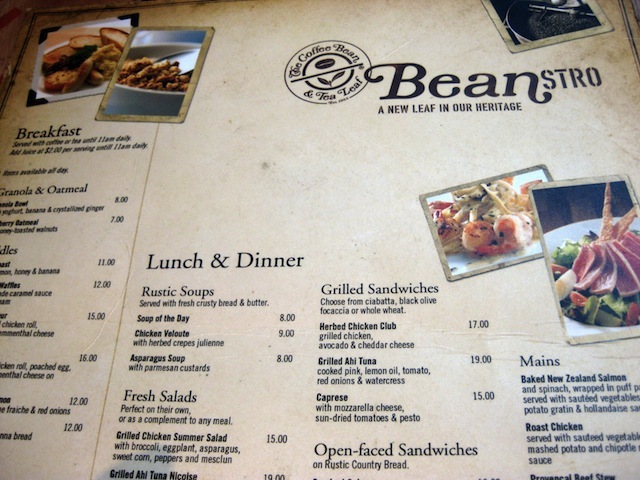 Beanstro, a new leaf in their heritage, is a bistro-style establishment offering not only legendary The Coffee Bean & Tea Leaf beverages, but also a wide array of fare. Breakfast dishes like eggs benedict are served in the mornings, and fresh sandwiches, pastas and more for lunch and dinner. 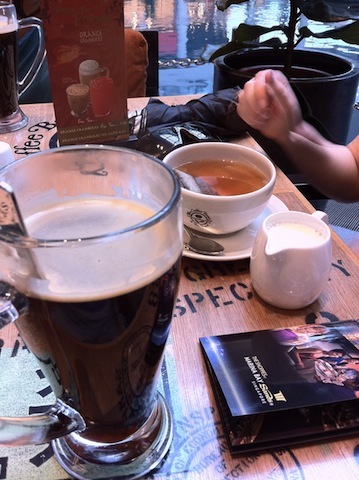 Pictured above is the largest Americano ever – it was like a pint of beer!